The Duke and Duchess of Cambridge resumed their royal tour today after taking a day off yesterday which they spent at their new home base at Government House in Canberra. This morning the royal couple left Canberra and headed to the Red Centre of Australia to visit the country's most famous natural landmark, Uluru (formerly known as Ayres Rock). The Duchess stepped off the plane wearing a Roksanda Ilincic dress which initially appeared to be a darker shade of her Roksanda Ilincic 'Peridot' Crepe Dress first worn in 2011 and again in 2012. 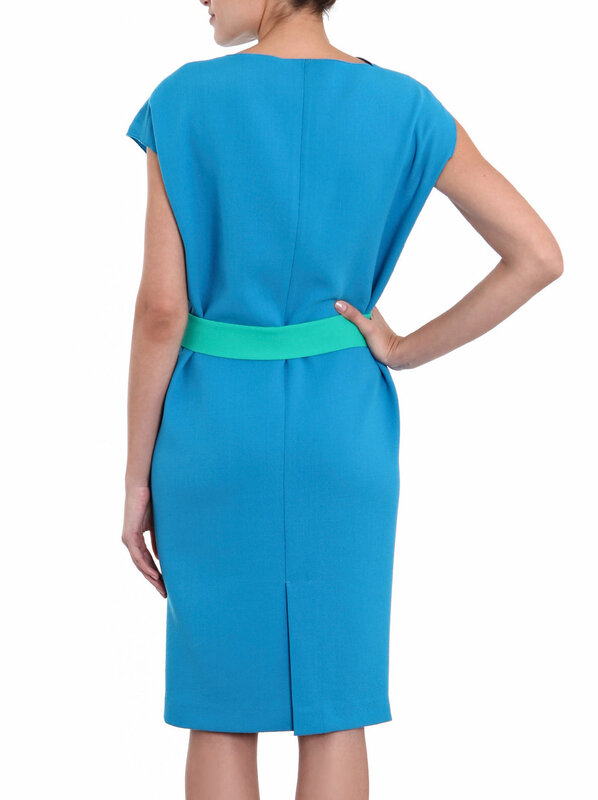 However, it was posted on WhatKateWore that Roksanda Ilincic released a similar design to the 'Peridot' called the 'Lovina', shown here in aqua. The 'Lovina' is a simpler design and does not have the extra features of the 'Peridot' dress, which include a mesh trim, peplum back, and exposed full-back zipper. 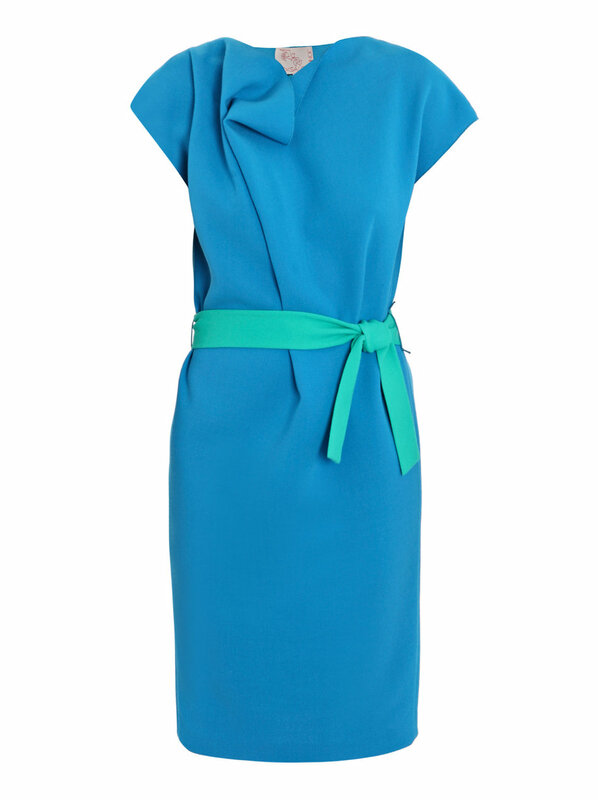 It appears that Kate interchanged the original self tie belt of the 'Lovina' dress with a different style. She accented her dress with a sand toned suede belt, which matched her customised Alexander McQueen suede clutch perfectly. I wouldn't be surprised if this is a bespoke belt from McQueen. On her feet were her trusty taupe patent LK Bennett Sledges. We saw the return of the Catherine Zoraida 'Double Leaf' gold earrings which the Duchess has worn on a few occasions since she originally wore them on the Jubilee Tour of Southeast Asia in 2012. Kate again wore her Asprey London gold 'Woodland' necklace, consisting of an acorn, mushroom and leaf charms. Upon arriving, the Duke and Duchess visited the National Indigenous Training Academy which trains members of the indigenous communities near Uluru in tourism and hospitality. This was followed by a “Welcome to Country” ceremony, performed by members of the local indigenous communities at the Uluru-Kata Tjuta Cultural Centre. Kate made a wardrobe change for the ceremony. She wore her Hobbs 'Wessex' dress cinched with the Hobbs 'Neston' ivory woven belt. On her feet were the natural Pied a Terre Imperia wedges. This is the exact same ensemble she wore on her visit to Bacon's College London in July 2012. This season, the natural 'Imperia' wedges were reissued under the Dune label. They are available for £85. The Duke and Duchess concluded the afternoon with a guided tour along the base of Uluru. The Duke and Duchess will spend the evening "glamping" at the Longitude 131 resort nestled on a secluded sand dune overlooking the iconic monolith.